Uefa has confirmed that Eric Bailly will miss the Super Cup and the first game in this season’s Champions League campaign. Bailly in action against Man City last week. MANCHESTER UNITED WILL be without Eric Bailly when they face Real Madrid in the Uefa Super Cup due to suspension. 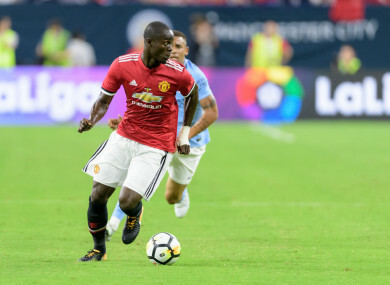 The Ivory Coast defender will also miss the first game of United’s Champions League campaign after Uefa confirmed Bailly had been handed a three-game ban following his dismissal in the second leg of United’s Europa League semi-final win over Celta Vigo last season. Bailly was sent off at Old Trafford after raising his hand to John Guidetti’s face, sparking a brawl which also saw Celta defender Facundo Roncaglia dismissed. The defender, one of United’s most consistent performers last season after joining from Villarreal, served the first game of his suspension in the final victory over Ajax and will be absent again when Jose Mourinho’s men tackle Madrid in Skopje. United beat Madrid on penalties in Santa Clara in the International Champions Cup on Sunday, but new centre-back Victor Lindelof conceded a penalty with a wildly clumsy tackle on Theo Hernandez. Bailly had played the first half of the fixture at Levi’s Stadium alongside Phil Jones, keeping Madrid at bay in a first half lit up by Anthony Martial’s stunning slaloming assist for Jesse Lingard’s opener. Email “Man United defender Bailly handed three-match European ban ”. Feedback on “Man United defender Bailly handed three-match European ban ”.